Mar Esteve Cortes, Director, Neolith, offers her thoughts on kitchen and bathroom trends for 2019. 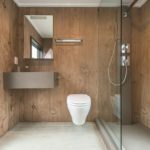 From a design perspective, there has never been so much choice available to housebuilders and property developers when they approach the kitchen and bathroom space. Ongoing research and development in the Sintered Stone surface market mean there is now something to suit any taste and application. From realistic colour palettes and sensitive detailing to silky smooth finishes and subtle texturing, the industry is constantly looking at ways in which to pioneer new colours and refine existing product portfolios. A combination of the latest technology and attention to detail, coupled with a healthy dose of imagination, is helping to drive innovation within the surfacing industry. Creating contrast is nothing new in interior design terms, but scope and ambition amongst interior designers has become greater as the amount of available colours, patterns and finishes has increased. New technology is driving this change: a greater degree of mimicry in engineered and Sintered Stone means hyper-realism in design with high performance properties. This presents the opportunity to apply long-lasting surfaces in kitchen and bathroom settings which will please all aesthetic tastes and preferences. Where grey tones have dominated in 2017/2018, a gradual return to more vibrant and vivid palettes has been observed. 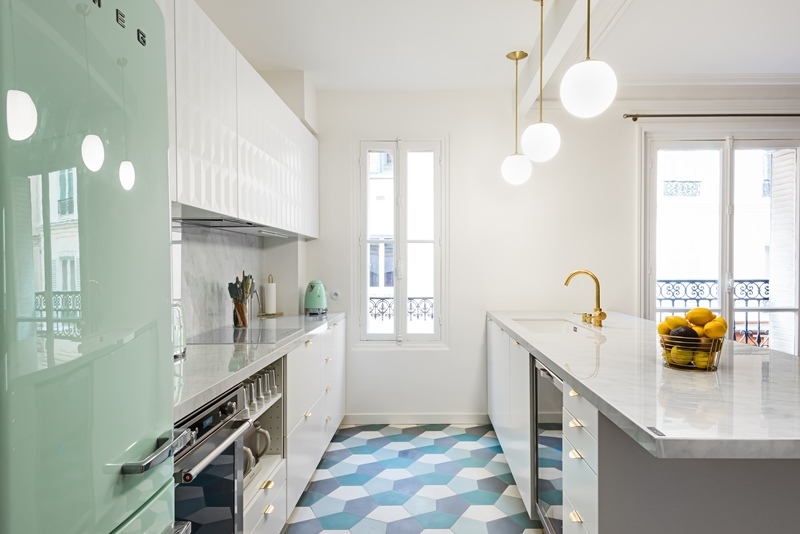 Brighter hues are being specified and a re-appreciation for the iconic Memphis School and the art of Keith Haring is encouraging kitchen designers to be bolder and more adventurous. Big splashes of base colour and high-volume tones are delivering punchy and distinctive interiors perfect for the ultra-modern dwelling. The organic look and feel of unpolished wood has timeless appeal and, with the steadily increasing desire for Scandinavian chic over the last few year, has become highly sought after. 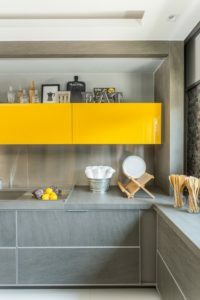 In contemporary kitchens it can be combined with contrasting materials such as Beton or Corten offering a captivating juxtaposition between the natural and industrial. Where ‘thin was in’ throughout the last couple of years, Neolith saw a distinct sea change in taste throughout 2017-2018. 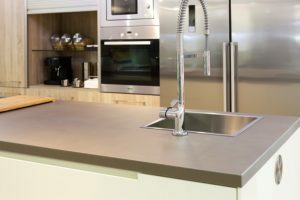 Numerous requests from kitchen and bathroom designers were registered for thicker Sintered Stone surfaces, especially for use as kitchen worktops and islands. In response to this growing interest, Neolith decided to add 15 colours to its 20mm range for 2018 and is set to introduce even more surfaces in this format for 2019. Thicker slabs establish a distinctive focal point when incorporated into a residential kitchen’s design as a central island or dining table-top. Nostalgia is nothing new, but across residential kitchens, Neolith has noticed a revived appreciation for design classic terrazzo. Throughout 2018, Neolith saw an increase in demand from both architects and specifiers for terrazzo, alongside other vintage designs. This playful and colourful stone once so popular, from bank floors to DIY applications, is finding a new lease of life as a chic surface in the home kitchen. 1950’s design sensibilities are firing the imagination of interior designers, from early Conran and Robin Day right through to the brutalist architecture of Le Corbusier and Denys Lasdun. Polished concrete evokes a minimalist aesthetic and is growing in popularity for kitchen Islands, worktops and dining room tables. With a rapturously smooth feel to the touch, stone manufacturers are starting to play on the matte, single tone effect. This ranges from experimentation with the finish through to adding shine particles to create a surface with a highly original character. Combined with wood, concrete effect surfaces deliver a fashionable atelier-chic, much prized in metropolitan areas across Europe. Marble effects such as Calacatta, Carrara and Estatuario are enduringly popular. Testament to this timeless appeal, last year Neolith was specified for the kitchen of renowned French pastry chef Anne-Sophie Rischard. She specifically asked for a polished finish to improve the consistency and texture of her pastries; the surface itself is perfectly smooth with incredibly low porosity, ensuring an unblemished dough. From an aesthetic perspective, Anne-Sophie chose Neolith Blanco Carrara as it creates a blank canvas on which her culinary masterpieces can stand out. This is especially useful for her, a consummate ‘Instagrammer’, offering an understated backdrop for filming and taking pictures of her creations. As baking becomes increasingly popular in the domestic sphere, more requests are being registered in 2019 for this type of pattern and finish.